We’d like to thank SD for today’s story. Bill was a regular guest of mine (6-7 visits) that summer at Oyster Bar Grill in Oak Bluffs on Martha’s Vineyard. We always seated him in our VIP section – elevated and separated, yet visible, from the main dining area. 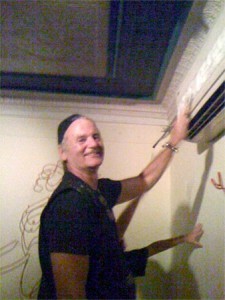 There was an AC unit on the wall that perpetually iced over, which drove Bill crazy. So finally, one night, he got up on a chair and spent 15 minutes cleaning it off… at 8:00 on a Saturday night in August, full house.